AS A NEW STUDENT, WHAT WILL I LEARN? 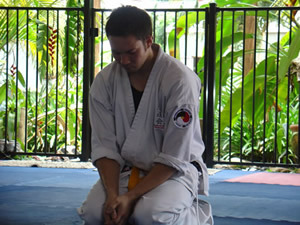 The system of Ki Sei Do Kai has been designed to be a complete Martial Art, as such, there are many things to learn. At the beginners level, Ki Sei Do Kai teaches basic boxing style hands and footwork, strikes, kicks, Tai Sabaki Kata and groundwork - all of which transfer into realistic self-defence drills. Early introduction into Ukemi (The Art of Defensive Falling) and impact training (Bagwork/Padwork), reaction drill training and basic understanding of Ki Principles all promote the students development of effective techniques. Soon more advanced techniques are taught as the student journeys through the belt system - these include throwing/takedown techniques, grip releases, and realistic in-close self defence techniques. The system of Ki Sei Do Kai teaches sparring through a structured sparring drill system. At the beginners level the student has time to develop confidence to progress to the next level. At the advanced levels, sparring becomes a fast, in-close dynamic form of self defence. At the Dan levels (after Black belt) the students still progress through more advanced throwing, restraining and in-close self defence techniques, with the end result being a martial artist trained in all facets of fighting - kicking, punching, striking, throwing/takedowns, restraining techniques and groundwork.